Fourteen months or so after the United States reopened its embassy in Havana, political repression in Cuba is as awful as ever. In fact, by one count, 2016, with two months still to go, is the worst year ever for human rights on the island. Perhaps it's not fair to link the two; after all, it's not like the Obama administration and many in the Republican Party have linked improvement in the human rights situation on the island to the strengthening of diplomatic, economic and other ties between the two government. Bluntly put, the freedoms of the Cuban people is not a priority. My disgust with this, as well as some personal and professional considerations, have contributed to my blogging being sparse in recent months. After almost 11 years of running this blog, I was a little burned out, not just from the self-imposed responsibility of trying to report as much of events and developments happening on the island, but also the frustration of fearing that all my efforts were for naught. No matter how much I reported about political repression in Cuba or tried to share the stories of those bravely resisting the Castro dictatorship, there were many more in this country eager to do business with the Castros or just vacation on Cuban beaches. My frustrations aside, however, the human rights situation in Cuba remains deplorable, and it remains a story that must be told. So here I am, not necessarily refreshed but nonetheless re-committed to doing the best I can or at least whatever I can to inform about the truth about the human rights situation in Cuba and those Cubans who risk what little freedom they have in search for a better, freer Cuba. The Cuban Commission on Human Rights and National Reconciliation this past week reported there were at least 620 politically motivated arrests in Cuba in October, bringing the total for the year to 9,125. That already surpasses the 8,899 arrests recorded in all of 2014, up to the now the worst year yet on the island. To be fair to the Castros -- don't worry, we don't make that a habit here -- the 620 arrests in October was 473 fewer, or more than 43 percent less, than in October 2015. But even if that downward trend continues for the final two months of this year, 2016 will end with more than 10,000 arrests for the first time since the human rights commission started counting in 2010. That, more than anything, is why Uncommon Sense is back. Cuban human rights activist Rolando Reyes Rabanal, who was one of 53 political prisoners released after the U.S. and Cuba re-established diplomatic relations in December 2014, was arrested Saturday after returning from a visit to Colombia. Reyes was detained by immigration officials at the Havana airport, before he was turned over to State Security. "It looks like he has been accused of 'public disorder,' but we don't have confirmation because they haven't explained where he is being held or why," said Antonio Rodiles, who heads ForoDyL. Since his release after President Barack Obama and dictator Raul Castro struck their deal, Reyes has been arrested numerous times because of his participation in the #TodosMarchamos campaign, which has been spearheaded by Foro DyL and the Damas De Blanco ("Ladies In White"). Rodiles said the dictatorship has recently increased its repression against members of the Foro DyL and other activists in the #TodosMarchamos campaign. This post will remain at the top of the page through June 25. During President Barack Obama's visit to Cuba in March 2016, dictator Raul Castro said he would be willing to release all political prisoners; all he needed was a list of names. Only the biggest fool would believe him, but several groups almost immediately released their lists. Of course, there was no mass release. 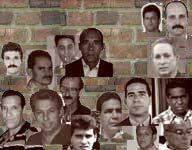 On April 25, the Cuban Commission on Human Rights and National Reconciliation, one of the most credible sources in Cuba for information on political prisoners released its updated list of 93 political prisoners. In that spirit, Uncommon Sense has revived one of its most important features, the Cuban Political Prisoner of the Week. The Human Rights Commission reports that Cuban authorities had repeatedly Santiago Cisneros Castellanos, an activist with the Patriotic Union of Cuba, for his numerous opposition activities, before he was arrested in July 2014 and sentenced to five years in prison for "public disorder." He also had been accused of possessing illegal arms, according to the commission. The Cuban secret police made at least 724 politically motivated arrests in May, according to the Cuban Commission on Human Rights and Reconciliation. It was the lowest monthly count since last July, when there were 674, but at best it was only a slight interruption to the torrid rate of repression in Cuba since the rapprochement with President Barack Obama and the United States, and all the "good" that has brought. The May census brought the total for the year to 6,075 -- or 70 percent of the 8,616 recorded in all of 2015. Since December 2014, when Obama and dictator Raul Castro struck their deal, there have been some 15,000 arrests, although it's likely the actual count is much higher. "Thus, despite the Obama Administration's engagement with the Castro dictatorship and increased travel to the island, repression on the island is exponentially rising," wrote Capitol Hill Cubans. "Why? Because the Castro regime keeps getting a pass for its repressive acts." For details on each arrest in May, go here. Wenceslao Chirino Perez, activist with the Patriotic Union of Cuba in Pinar del Rio, was arrested Feb. 9, after he was summoned to a police station, where he chastised a police official for harassing his sister. The cop responded by throwing him in a jail cell on a charge of "disrespect." According to the Human Rights Commission, Chirino was later sentenced to 18 months in prison. A major goal of this blog since its inception more than 10 years ago is to recognize those brave Cubans imprisoned because of their opposition to, and their actions in service of their beliefs, against the Castro dictatorship. It is one small step to ensure that they, and their oppressors, know that they are not forgotten. Joel Bencomo, a citizen-journalist and an activist with a group headed by the famed dissident Guillermo Farinas, was arrested Oct. 1, 2014, convicted of "disrespect" and sentenced to two years in prison. At one point, his captors tried to transfer him to a forced labor camp, but he "refused to budge." Four of the most powerful voices in the Cuban opposition -- the former "black spring" prisoners of conscience Dr. Oscar Elias Biscet, Jose Daniel Ferrer Garcia, Ivan Hernandez and Felix Navarro -- traveled to the United States last week to meet with supporters and to spread their message. If they return to Cuba -- and there is no reason to believe they won't -- this may be the only time the Castro dictatorship allows them to travel, as they remain on "parole" since their release from prison in 2011. The parole left them as prisoners in their own country, but they were recently informed they would have one chance, and one chance only, to travel overseas. What Biscet, Ferrer, Navarro and Hernandez did and say during their respective visits to the U.S., you can read elsewhere. (Like here, here and here.) As giants of the struggle for Cuban freedom, they are deserving of your time and attention. That they are free, at least for now, to comment on events in Cuba and how Cubans are resisting the Castro dictatorship, is very satisfying for this blog and others who have worked so diligently to make sure they are forgotten. In a struggle that has seen so few victories, that is something worth celebrating. As part of its overall repressive nature, the Castro dictatorship carries on a vicious war on women, especially those who dare to challenge its rule. Just asked the Damas De Blanco, or "Ladies In White," who each Sunday are targeted by the police and other goons when they try to march as a group to Mass. Often, Damas who are arrested are released after a few hours. But Martinoticias.com on Sunday reported that two Damas -- Yaquelín Heredia Morales and Marieta Martínez Aguilera, as well as two other activists, Xiomara de las Mercedes Cruz Miranda and Yunet Cairo Reigada -- have been held without trial since they were arrested April 15. All four are members of the Patriotic Union of Cuba, which along with the Damas is one of the more effective opposition groups on the island. The four were arrested at a Havana park when police tried to search Martinez's purse, and the others came to her defense. They each face charges of "attacking" and "contempt." Heredia also faces a charge of "damages." An independent lawyers group filed writs of habeas corpus to force the women's release, but they were unsuccessful. According to the Martinoticias report, UNPACU said the women committed no crime, and that they are being prosecuted only because they were exercising their right to free expression. As a result, the Cuban Commission on Human Rights and National Reconciliation in early May said the women should be recognized as prisoners of conscience. The Damas De Blanco, or "Ladies In White," may be the most effectual opposition group in Cuba, courageously standing up to the Castro dictatorship on behalf of their imprisoned loved ones to demand their release and the release of all political prisoners. Not surprisingly, they also have paid a heavy price, as evidenced by how the Castro secret police and its thugs routinely target these women, simply for trying to march peacefully to Mass each Sunday. Each week, dozens of these amazing women are arrested and detained for several hours, if not longer. Dama De Blanco Maria del Carmen Cala Aguilera, of Holguin, in eastern Cuba, has been unjustly imprisoned in the Castro gulag since April 2015, when she was arrested after she called the doctor she held responsible for her son's death, a "murderer." Luis Miguel Arias Cala was on parole after serving 15 years in prison for murder and other charges, when he fell ill and died in October 2014. Calas was charged with "attacking" -- a specious charge often leveled against opposition activists -- and sentenced to 3 1/2 years in prison. The Human Rights Commission said Cala also is a member of the Patriotic Union of Cuba, another active and somewhat successful opposition group on the island. For more about Cala, read this report from exiled Cuban journalist, and former prisoner of conscience Juan Carlos Herrera Acosta. The Castro dictatorship have labor activist Osvaldo Arcis Hernandez prior warning: If you don't end your anti-Castro activism, there would be dire consequences. For example, in July 2015, Arcis was detained for two hours, during which he was threatened with jail if he persisted with his opposition work. In December, the dictatorship made good on the threats, sentencing Arcis to two years in prison, after finding him to be a "pre-criminal social danger," the Orwellian pre-crime the regime has long used to take its opponents out of a commission. After all, think about all they could if left unchecked. The dictatorship wouldn't be able to stand it. For more about Arcis, listen to this interview with Radio Marti.